The US embassy has donated a library of 750 English-language books to the Thinadoo Primary School in Gaafu Dhaalu Atoll. “The United States supports expanding educational opportunities around the world,” said Young Hwan Joo of the US embassy to the students at the school. The books, with a total cost of cost of $10,000, range from early to more advanced stories to text books and teaching aids. They will be used in classes, but also taken home for reading assignments and personal enjoyment, explained a US embassy press release today. This is the second in a series of twelve book drops planned for islands in the outer atolls. The first took place in March 2014 in Fuvamulah. “These donations address critical educational needs in remote areas where the delivery of books has been difficult,” continued today’s press release. Officers and crew from the USS Rodney M Davis visited the Kudakudhinge Hiya orphanage or children’s home in Vilimalé yesterday (October 8 ) and assisted with painting and repairs. 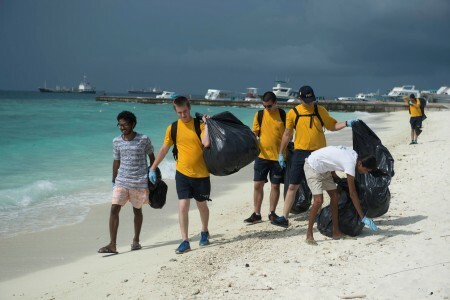 “The American sailors also worked with a local environment group Save the Beach Maldives to clean up island debris later that afternoon,” reads a press release from the US embassy in Colombo, Sri Lanka. The USS Rodney M Davis – an Oliver Hazard Perry-class guided-missile frigate with the US 7th Fleet – visited the Maldives this week on its last tour of duty. The 27-year-old, 4000-ton, 435-feet long, and 45-feet wide frigate is due to be retired by the US Navy. Local journalists were invited for a tour of the ship on Tuesday (October 7). In its last major operation in 2010, the frigate seized over 1,500kg of drugs from a vessel in the South Pacific Ocean. “The area is critical to regional security, and the partnerships we build with this training will go a long way to creating a more professional and stable maritime environment,” he was quoted as saying in an earlier press release. The embassy meanwhile noted that the sailors volunteered their personal “liberty” time to participate in the activities in Vilimalé yesterday with support from the Maldives National Defence Force (MNDF) and Ministry of Law and Gender. “Time off is very precious because our sailors put in long hours while we are at sea,” said Lt. Russell Wolfkiel, public affairs officer for the Rodney M. Davis. The American sailors repainted the interior of the orphanage while special fire safety trainers explained how to service fire extinguishers and demonstrated their proper usage. “This is very important for us. We are very appreciative of your team to come here and do some painting and to take some time to explain the fire alarm systems,” said Mohamed Shafeeg, deputy director of Kudakudhinge Hiyaa. A second group of sailors meanwhile joined a clean-up event organised by a local youth group called Save the Beach Maldives. The debris collected from across the island included heavy concrete pieces left over from construction projects. “We hope more people want to help places like this in the future because it’s not just a problem for Maldives here. It’s a problem for everyone around the world,” said Fathimath Thanzeela Naeem, the lead coordinator for the clean-up. The Rodney M Davis departed today after concluding its four-day stopover. “I like being able to come overseas and help out other people and see how they live,” said Petty Officer Daniel Cornede. A United States naval ship is due to visit the Maldives in mid-October as part of a routine patrol of the Indian Ocean, the US embassy in Colombo, Sri Lanka has said. The USS Rodney M. Davis is “an Oliver Hazard Perry-class guided-missile frigate with the U.S. 7th Fleet”, the embassy explained in a press release. “It will be tremendously beneficial to build on our excellent relationships with the maritime nations of the Indian Ocean,” the press release quoted Vice Admiral Robert Thomas, Commander US 7th Fleet, as saying. “My crew and I are excited to visit the Maldives,” said Commander Todd Whalen, commanding officer of the Rodney M. Davis, expressing gratitude to the Maldivian government for the opportunity to visit the country. The US Embassy, in partnership with the Ministry of Education, has delivered US$13,000 (MVR201,000) worth of books to the Gnyaviyani Atoll Education Center in Fuvahmulah. “These books, aimed at primary and secondary grades, will help teachers and students develop their English language skills so they can enhance their opportunities for further education and a dynamic future,” said Ambassador Michele Sison at a ceremony held yesterday (March 2). “We are proud to support the success of Maldivian students through the friendship and goodwill of the American people,” she continued. An embassy press release revealed that yesterday’s donation was the first of eleven planned for the outer atolls. The donation was made possible by the NGOs Spirit of America and the Asia Foundation. “Political differences are not unique to Maldives, and they should not be allowed to derail the process,” United States Embassy in Colombo has said. “Such issues could result in damage to Maldives’ international reputation and impact negatively upon the Maldivian economy,” the statement continued. The third attempt to complete the presidential election has been scheduled for Saturday (November 9), with the date for a potential second round on the 16th. Following the initial poll on September 7 – which appeared to have set up a run-off between Maldivian Democratic Party (MDP) candidate Mohamed Nasheed and Progressive Party of Maldives candidate Abdulla Yameen – the US urged all sides to accept the results, calling the much-praised poll a “victory for democracy”. Prior to the re-scheduled October 19 poll, the US had expressed concerns – later realised – at the potential for continued legal actions to cause further delays. “Since the September 7 first round of elections were annulled via questionable tactics, we have been actively engaging with all political parties and independent institutions to encourage a way forward that is in line with Maldives’ constitution,” continued yesterday’s statement. A motion was passed last week detailing transitional arrangements for the Majlis speaker to take the interim presidency, prompting the Jumhooree Party candidate – and filer of the complaints which led to the annulment of the original poll – Gasim Ibrahim to suggest that handing power over to the military would be preferable. “Isn’t it better that our military takes over the country to save the country and maintain peace?” local media quoted the businessman and MP as saying. Repeated delays of the presidential elections have evoked concern from across the globe, with the UK government also expressing its concern that the Maldives’ reputation would suffer should the current political crisis not be resolved with free and fair elections. Minister of State at the Foreign and Commonwealth Office Hugo Swire told the UK’s House of Commons last week that he feared for the economic future of the country. MDP candidate and former President Nasheed has also suggested that foreign actors were preparing for economic sanctions should no president-elect be confirmed by November 11. “Ambassadors of foreign nations that I meet are now saying very openly that if there is no president-elect by November 11 they would have to take action under their normal rules or procedures,” Nasheed has reported. A recent spate of legal actions against opposition MPs has also caused international concern, with the Inter-Parliamentary Union last week arranging an urgent visit to the Maldives in an attempt to build trust between feuding state institutions. Opposition Maldivian Democratic Party (MDP) presidential candidate Mohamed Nasheed has met with the US Ambassador to Maldives and Sri Lanka Michele J. Sison today. During the meeting, Nasheed and the US ambassador discussed on the outcome of last Saturday’s presidential election and the scheduled run-off contest scheduled for September 28. According to former president’s official website, the duo also discussed the importance of holding a free and fair election. Nasheed told the ambassador that it was important to provide technical support to all state institutions including the police and the Elections Commission (EC) in order to ensure the credibility of the presidential polls. He also expressed concern over current Commissioner of Police Abdulla Riyaz, who was found guilty of politicized tweets by the Police Integrity Commission. Ambassador Sison meanwhile welcomed the outcome of the first round of election and commented on how well the election had been facilitated. She also urged all political parties to accept the results of the election and appealed to the public to maintain peace and order in the upcoming run-off elections. The meeting was attended by Nasheed’s Special Envoy Ibrahim Hussain Zaki, MDP’s Chairperson ‘Reeko’ Moosa Manik, former Foreign Minister Ahmed Naseem, MDP Spokesperson MP Hamid Abdul Ghafoor and MDP’s Deputy Chairperson Ali Shiyam. The biased editorial practices of media outlets owned by politicians is one of the major impediments preventing the right to information from being upheld in the Maldives, journalists and civil society actors highlighted during discussion panels organised by the US Embassy this week. Maldivian journalists and NGO leaders met with representatives from the US Embassy, the UN, as well as a US attorney representing the American Society of News Editors, Kevin Goldberg, to discuss the current status and future efforts needed to protect this human right in the Maldives. The state is the guardian of information and the public have a right to access that information, according to the forum. This is essential for not only holding the government accountable to the public – so residents of the Maldives can understand what the government is doing for the people – but also for instilling public trust in government institutions. Any type of information, including documents, electronic records, audio, video, etc., produced, held or maintained by a state institution should be easily accessible. Uninhibited access to events held in the public domain, such as protests, are also protected, the forum was informed. Journalists and NGO representatives alike noted the lack of cooperation from government institutions as well as the shortcomings of media outlets in disseminating balanced information. The media discussion panel held Monday (August 12) was nonetheless poorly attended, with three journalists from Sun Online, one Maldives Media Council (MMC) official, and one Minivan News representative participating. While two Maldives National Broadcasting Corporation (MNBC), also known as Television Maldives (TVM), reporters were present during part of Attorney Kevin Goldberg’s opening remarks, they left prior to the group discussion taking place. No representatives from the Maldives Broadcasting Commission (MBC), Raajje TV, Villa TV (VTV), DhiTV, Haveeru News, Channel News Maldives (CNM), Miadhu News, or Minivan Radio attended the event. Although the panel was small, discussion was lively, with everyone in attendance concerned about editorial policies that catered to the government or a specific political party, which they said had staunched the flow of information reaching the Maldivian public. Unbalanced reporting in favor of the state during the February 2012 controversial transfer of power that followed former President Mohamed Nasheed’s resignation, as well as government authorities cutting Maldivian Democratic Party (MDP) aligned-Raajje TV’s feed, were highlighted as concerns. In addition to the need for a culture of balanced, ethical reporting, journalists highlighted the difficulty in obtaining information from various government representatives and institutions. Goldberg noted that “information delayed is information denied”, and that procedural mechanisms should be in place to allow the public, including journalists, easy access information. The state should “proactively disclose” information of public interest, individuals “shouldn’t have to ask for it”, he said, explaining that readily available information was as much a means for public officials to protect themselves from the media as it was for the media in conducting investigative journalism. Goldberg, as well as the Human Rights Advisor to the UN Resident Coordinator’s Office, Safir Syed, stated that MBC’s requirement that journalists be licensed to enter a protest was a human rights violation. Goldberg emphasised that it takes time to build enough collective momentum to effectively pressure a government to uphold the right to information, and that collaboration between media outlets and civil society was essential to do so. NGO representatives echoed the concerns noted by journalists during the discussion panel held Tuesday (August 13) and emphasised that unethical reporting and the media’s lack of cooperation with NGOs had limited civil society’s trust of local media outlets. The inability to appeal to the judiciary to obtaining access to public information was also highlighted as a problem. Transparency Maldives Project Director Aiman Rasheed explained to Minivan News that while Article 19 of the Maldivian Constitution guarantees the right to information, current practice was limited to the executive. He added that the right to information regime needs to be spread across all state institutions, including the judiciary, parliament, independent commissions and state companies. Furthermore, the Maldives is a signatory to the International Convention on Civil and Political Rights (ICCPR), which also protects this human right. The United States government has pledged US$9.7 million (MVR 149 million) to the Maldives as technical assistance for climate change adaptation and election preparations. The memorandum of understanding (MoU) between the two nations was signed yesterday afternoon (July 7) by the Maldives Ministry of Foreign Affairs Ambassador-at-large Abdul Azeez Yoosuf and U.S. Agency for International Development (USAID) Acting Mission Director Todd Sorenson. The United States Ambassador to Sri Lanka and the Maldives Michele J Sison highlighted the importance of the agreement during the American Embassy’s Independence Day reception held last night (July 7) in Male’. “The MoU will allow us to expand and enhance our bilateral cooperation, it is a truly special day… [it is my] sincere hope that the many ties that bind our two nations will grow ever stronger,” Sison stated. Under the MoU, USAID will provide US$7.2 million for a global climate change adaptation project, and US$2.5 million as technical assistance for election preparations. The Ambassador highlighted the importance of consolidating democracy and promoting the integrity of the electoral process prior to the September 7 presidential elections as the impetus for the US working with Maldivian partners to prepare for elections. One of the new programs covered under the MOU, through USAID, was launched by the U.S.-based International Foundation for Electoral Systems (IFES). “These efforts will promote the integrity of the electoral process in Maldives in advance of the September 2013 presidential elections, but also support efforts aimed at the local council and parliamentary elections which are to follow [in 2014],” said Sison. “The US has urged all parties all actors here to work together to chart a positive way forward that respects the Maldivian constitution, Maldivian democratic institutions, human rights and the will of the Maldivian people,” she continued. “As such, we’ve called on all sides here to work closely together to ensure the elections in Maldives are free, fair, transparent, credible and inclusive and that the results are accepted by all stakeholders,” she added. The US government in partnership with the UN is also “actively supporting” a small grants program for Maldivian civil society. “The US is proud to be supporting Maldivian efforts to strengthen civil society and consolidate the democratic transition,” she added. The Ambassador also reflected on the founding of the United States, the evolution of democracy within the country over the last 237 years, and the democratisation process in the Maldives. She noted the personal responsibility of citizens to strive toward a more perfect union by pushing forward, speaking out when there is injustice, and advocating for those who cannot advocate for themselves, as President Barack Obama noted in a 2008 presidential campaign speech. “I thought of those words – both of our founding fathers and of President Obama – as I thought about the Maldives, because in the coming weeks and months ahead, reflecting the vibrancy of Maldivian institutions, the Maldivian people will once again make their voices heard in a democratic process,” said Sison. The American Embassy’s other current initiatives include “robust USAID projects” aimed at increasing Maldivian capacity to cope with the impact of climate change and improving water security. USAID is also working with the Maldivian government to identify additional areas of cooperation related to climate change adaptation. The US is also becoming “increasingly active” in the Maldivian economic and commercial sector. “I’m happy to report that a number of other US companies are looking to expand their operations here, their presence and investment in the Maldivian economy,” noted Sison. Furthermore, US initiatives have also been extend to the education sector with the “Access English Language” teaching program – with programs in Male’, Addu City, and Kulhudhuffushi in Haa Dhaal Atoll – and “Access Microscholarship”. “The goal of these english language enrichment microschoarlips is to enable Maldivian secondary school students to pursue higher education and to increase their employment opportunities – we hope – in the job market,” Sison explained. She also noted that US is “very proud” that the cooperation, joint exercises, and training endeavours conducted with the Maldives National Defence Force (MNDF) and the Maldives Police Service remain “very strong and robust”. “The US knows that all of you are as committed as we are to the prosperity of Maldives, to the democracy of Maldives, and to the well being of Maldives. We hope to work together with you in a way that will inspire and benefit future generations of young Maldivians,” the ambassador concluded. Maldives’ Minister of Defence Mohamed Nazim assured the attendees of the US Embassy’s independence day event – who included the Indian High Commissioner Rajeev Shahare, various UN agency officials, and Maldivian government ministers – that the government of Maldives was committed to ensuring elections were “free, fair and competitive”. “Exactly two months from today maldives will vote in a historic election to elect a president,” said Nazim. “We are grateful to the United States for the Maldives election program 2013-14 which will contribute profoundly to strengthen the capacity of state institutions and civil society organisations in preparing for the presidential elections,” he added. Nazim also highlighted other “key global issues of mutual concern” both governments and working closely on, particularly in the areas of national defence, promoting democracy and the respect of fundamental human rights, as well as climate change adaptation. “The Maldives-US defence cooperation which has been vital in enhancing our national defence capabilities,” he noted. “Climate change is too critical an issue to be left unaddressed. We need to find solutions and be ready to make hard decisions and hard choices,” he added. “The relationship is based on a solid foundation of friendship, shared beliefs, and mutual respect. The US continues to be a close partner of Maldives through diverse spheres and greatly contributes toward the socio-economic development of the country,” Nazim concluded.